The Best Zoology blogs from thousands of top Zoology blogs in our index using search and social metrics. Data will be refreshed once a week. Also check out Zoology Podcasts and Zoology Youtube Channels. 2.43 Pixie Zoologist | blogging about zoology, birds and body clocks! Zoology newsletter is a comprehensive summary of the day's most important blog posts and news articles from the best Zoology websites on the web, and delivered to your email inbox each morning. To subscribe, simply provide us with your email address. London,UK About Blog Frontiers in Zoology is an open access, peer-reviewed online journal publishing high quality research articles and reviews on all aspects of animal life. It is the first open access journal focusing on zoology as a whole. It publishes high quality research and reviews on zoological issues that will be internationally accessible. Facebook fans 59,278. Twitter followers 49,188. About Blog Reddit is a community of millions of users engaging in the creation of content and the sharing of conversation across tens of thousands of topics. A sub-reddit for study of the behavior, structure, physiology, classification, and distribution of animals. Facebook fans 1,175,210. Twitter followers 534,280. About Blog The Journal of Zoology publishes high-quality papers of an original nature in areas of zoology that are novel and in particular are interdisciplinary. Facebook fans n/a. Twitter followers 8,291. United Kingdom About Blog Hi I'm Dr Karl Shuke. I am a Zoologist & author writing on cryptozoology (mystery animals) & zoomythology. My blog ShukerNature explores cryptozoology & animal mythology - bigfoot, chupacabras, yeti, vampires, sea monsters, Nessie, sasquatch, dragons, mystery cats. Facebook fans 931. Twitter followers 2,268. About Blog Zoological Radio is a production of the Santa Barbara Zoo. Their wild and crazy team really puts the ham in radio. This podcast features interesting stories about animals from interesting people. About Blog Cryptomundo is a number one website for cryptozoology news and opinions worldwide. It is a place to enjoy the adventures, treks, theories, and wisdom of some of the most respected leaders in the field of Cryptozoology. It is a place for all ages to share, read, see, and learn about the finds and evidence of the most elusive and rare animals (cryptids) on this planet Earth. Facebook fans 11,407. Twitter followers 6,720. Portland, Maine About Blog Hi I'm Loren Coleman. I am a Cryptozoologist, museum director, author, television personality and a social scientist. I blog about cryptozoology. Facebook fans n/a. Twitter followers 8,852. About Blog Zoomology explores our planet from top to bottom, getting up close and personal with wildlife from across the world. Facebook fans 516. Twitter followers 97. Czechia About Blog Hi we are zoologists and wildlife documentarists Matej and Zuzana Dolinay. Together we present Living Zoology, a project which informs about life of wild animals, especially reptiles and amphibians. Facebook fans 3,201. Twitter followers n/a. About Blog Hi I'm Malcolm Peaker. Zoology Jottings is my blog that meanders through the animal kingdom, from aardvarks and anoles, through mouse and man, to zorillas and zebras. Dublin City, Ireland About Blog My name is Paolo Viscardi. I’m the Zoology curator. I blog about my thoughts on a variety of scientific, sceptical and museological subjects. Facebook fans n/a. Twitter followers 6,760. San Francisco, CA About Blog Reddit is a community of millions of users engaging in the creation of content and the sharing of conversation across tens of thousands of topics. A sub-reddit for discussion about Cryptozoology. Facebook fans 1,175,378. Twitter followers 534,445. Guilford CT About Blog Hi, I’m Andrew and I’m just a simple zoology student and crustacean researcher from Ohio. This blog centers around animal IDs. I also occasionally post random zoology/animal factoid things. About Blog Anole Annals is written and edited by scientists who study Anolis lizards. Find source for the latest on Anolis lizards. Find new scientific research, natural history anecdotes, evolution and a wide range of other anole-related information. Facebook fans n/a. Twitter followers 994. Cambridge About Blog The Department of Zoology, University of Cambridge, is located on the New Museums Site in central Cambridge. Find News and events from the Department of Zoology. Facebook fans 1,463. Twitter followers 450. About Blog The Invertebrate Collections is one of the University Museum’s large collections of scientific zoological material. This is the blog is about the Invertebrate Collections at the University Museum of Bergen, Norway. We inform those interested about the contents of the collections and about our past and current activities. Facebook fans 4,712. Twitter followers 1,083. About Blog Zooniverse is the world's largest and most successful citizen science organisation. Their project include Galaxy Zoo, Old Weather, Planet Hunters, Snapshot Serengeti & more. Facebook fans n/a. Twitter followers 18,372. About Blog Dr. Jungles Pets and Animal Speak is a encyclopedia of animals, Educational resource for animals and pets, pet care and animal pictures for dogs, cats, fish, birds, saltwater fish, exotic pets, coral reef, small animals, reptiles, amphibians, and horses. About Blog IASZoology.com is a website for the students and researchers in Zoology and Entomology. I blog about zoology and entomology. London, UK About Blog Real Monstrosities is a journey amongst the weird, the wonderful and the downright ugly of the natural world. Find posts on various monstrous wildlife. Facebook fans 2,499. Twitter followers 839. RAdelaide, 'Straya About Blog ConservationBytes.com is dedicated this site to highlighting, discussing and critiquing the science of bio-wealth conservation. We stimulate scientists and any interested in maintaining their future to find real-world solutions to limit and reverse the degradation of ecosystem services supporting life on Earth. Facebook fans n/a. Twitter followers 8,675. Washington, D.C. About Blog This blog contains postings from the broad diversity of individuals who make up the Invertebrate Zoology community. It is meant to be a spot for reporting both happenings and topics of interest to IZ community members to an audience ranging from others interested in invertebrate zoology. Facebook fans 4,664. Twitter followers 4,886. About Blog The International Commission on Zoological Nomenclature (ICZN) acts as adviser and arbiter for the zoological community by generating and disseminating information on the correct use of the scientific names of animals. Several million species of animals are recognised, and more than 2000 new genus names and 15,000 new species names are added to the zoological literature every year. About Blog Primatology.net is a blog run by a group of volunteers interested in the research, preservation, and conservation of primates. We post current research, news, book reviews, videos, and other forms of media that are related to primates. We blog on topics that we will cover are ecology, psychology, biology, anthropology, medicine, as well as others. Facebook fans 1,824. Twitter followers n/a. About Blog Hi I'm Carl Safina and I'm the founding president of The Safina Center. I blog about nature, science, living animals and their experiences. Facebook fans 6,224. Twitter followers 17,807. About Blog Amazing Zoology is a website dedicated to providing new findings related to animals science from animal diversity to molecular biology. Find posts and updates on latest findings and activities in zoology with articles, videos, lessons and text book series. Facebook fans 10,261. Twitter followers 443. Trinity College, Dublin About Blog The Ecology & Evolution blog of the School of Natural Sciences, Trinity College Dublin. Find posts and updates on plant-pollinator networks, food-webs, ecosystem stability, animal social interaction networks, parasitology, plant systematics, marine biology, morphological evolution, palaeontology, behavioural ecology, biodiversity research and developmental biology. Facebook fans 198. Twitter followers 460. About Blog CFZ Australia is a branch of the non-profit UK-based Centre for Fortean Zoology (CFZ). We're naturalists, authors, photographers, and academics with a strong interest in zoology. CFZ examines unusual and aberrant animal behavior, animal mutilations, animal colour variants, teratology, and animal folklore. Woolsery, North Devon About Blog Hi I'm Jon Downes. I am a Author, musician, filmmaker, manic-depressive, singer, grandad, editor, husband, stepdad, poet, cripple, cryptozoologist. The CFZ (Centre for Fortean Zoology) hunts for mystery animals. Facebook fans n/a. Twitter followers 890. Long Beach About Blog Zoology for Kids is a science book that connects wildlife enthusiasts to the wonderful world of zoology. It covers science news, highlight conservation issues and success stories, and interview zoologists. Facebook fans 3,827. Twitter followers 746. About Blog hi I'm Malcolm. I am a zoology graduate, ex-public servant, globetrotter, author, and amateur polymath. Cryptozoology is the investigation of animals not yet recognized by science, but whose existence is hinted at by eye witness accounts, photos, or traces. I provided a major review of Australian cryptozoology in my 1996 book, "Bunyips and Bigfoots". This blog aims to report on that research. About Blog Conjour is a conservation magazine focused on animal conservation education and celebration, zoological reviews and wildlife photography features. Facebook fans 1,179. Twitter followers 337. Concord, NH About Blog Hi I'm Pete Larson. I am a Biology/zoology teacher, runner, blogger, & recovering academic (frog evolution). I currently teach AP Biology, Honors Biology, and Zoology. Facebook fans 48. Twitter followers 4,898. About Blog Tetrapod Zoology is the podcast of the famous blog by Darren Naish, with John Conway as the straight-man. Discussion of all things tetrapod and vertebrate palaeontology, and many things not. About Blog Michigan State University students in the Holekamp Lab blog about their experiences in Kenya, research on spotted hyenas and adventures in the field. About Blog Speculative biology is simultaneously a science and form of art in which one speculates on the possibilities of life and evolution. Facebook fans 1,032. Twitter followers 43. About Blog Zoology Learning Point is a website is specially meant for students of B.Sc. (Biology group), M.Sc. (Zoology). A separate section in the name of Primary Education is specially meant to fulfil the needs of primary education. This website is created to fulfill the needs of students of Life sciences specially Zoology. Woolsery, North Devon About Blog Hi I'm Jon Downes. I am an author, musician, filmmaker, manic-depressive, singer, grandad, editor, husband, stepdad, poet, cripple, cryptozoologist & Director, Centre for Fortean Zoology. I blog about cryptozoology. About Blog The Museum of Vertebrate Zoology (MVZ) at the University of California, Berkeley, is a center for research and education in the biology of amphibians, reptiles, birds, and mammals. We provide videos on international research on evolutionary biology from the perspectives of systematic, ecology, behavior, functional and developmental morphology, population biology, and evolutionary genomics. Facebook fans 985. Twitter followers n/a. Limón, Costa Rica About Blog Hi I'm Asha Tanna. I am Brit journo w a Masters in Primate Biology/Behaviour & Conservation. I qualified with a Masters in Primate Biology, Behaviour and Conservation in 2012. Facebook fans n/a. Twitter followers 1,771. 43. Pixie Zoologist | blogging about zoology, birds and body clocks! Glasgow, Scotland About Blog Hi I'm Robyn Womack. I am a zoology fanatic. I have a broad interest in everything zoological – from paleontology to parasitology. I blog about the huge diversity of animal life on Earth. Facebook fans n/a. Twitter followers 1,575. Middletown, OH About Blog Zoology At MHS is a page is designed to help Middletown High School students stay connected with the world of zoology outside of the classroom. About Blog I'm currently getting my M.A. in Anthropology focusing on studying Primates. I blog about Primatology and Zoology. About Blog Find posts and updates on cryptozoology. United States About Blog Hi I'm Evan Boucher. I am a CG artist. I like cartoons and am kind of unreasonably obsessed with animals. I blog about cryptozoology and posts animal cartoons and much more. About Blog Hi I'm Matthew. I’m currently studying Zoology with Herpetology at Bangor University and have had a passion for wildlife my entire life. Zoology notes is, a collection of my jottings as a zoologist. It will be containing records of creatures that I find, information on animals that I am particularly interested in, news from the world of zoology and a few tips and tricks that I pick up. About Blog Hi I'm Vadim Sidorovich. I have been in zoological studies since 1982, Doctor of Biology since 1989, Professor since 2007. I blog about my former zoological way and to tell about the questions that I have investigated recently. About Blog I find the entire animal kingdom fascinating. I blog about animal kingdom. London, UK About Blog The Zoological Society of London (ZSL) is a charity devoted to the worldwide conservation of animals and their habitats. Find videos on conservation of animals of the world. Facebook fans 138,049. Twitter followers 63,594. 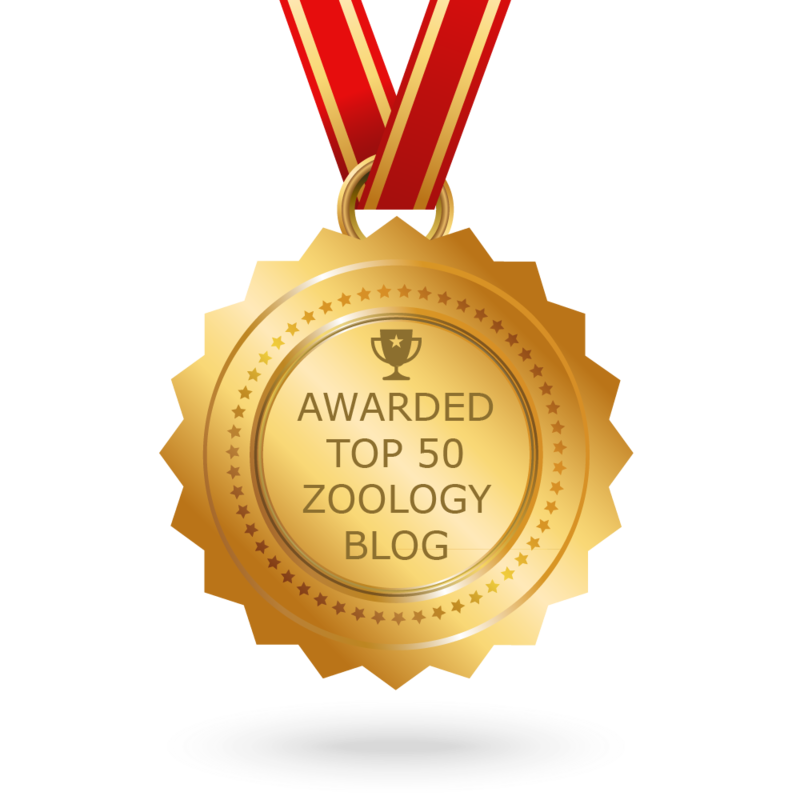 CONGRATULATIONS to every blogger that has made this Top Zoology Blogs list! This is the most comprehensive list of best Zoology blogs on the internet and I’m honoured to have you as part of this! I personally give you a high-five and want to thank you for your contribution to this world.